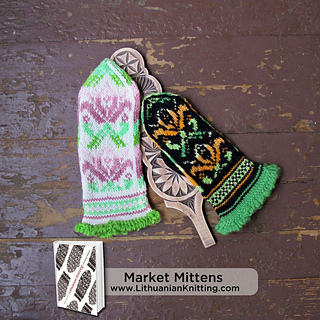 These mittens are inspired by the many pairs of colorful mittens knitted with flo- ral motifs found in the tourist markets in Vilnius. Floral designs are often knitted in shades of pink, yellow, and blue on a white or black background, or in undyed grey or brown wool on a cream background. 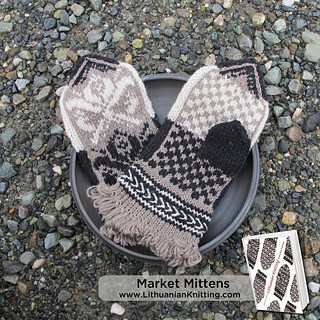 Made with worsted weight yarn on fairly large needles, these mittens knit up quite quickly, making them profitable to sell in quantity by the market vendors, and great for gift knitting as well. The fringe cuff and the multiple shades of the same colors used to paint the leaves and flowers are traditional Lithuanian style, as is the use of a simple check pattern on the palm and the simple peasant thumb. 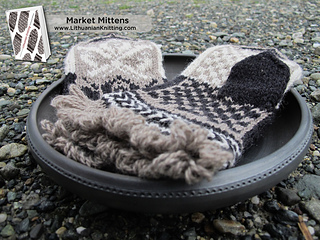 The mittens sold in the mar- kets almost always have a pointed fingertip shape, reminiscent of Scandinavian designs, although the older mittens in museum collections more frequently have rounded fingertip shaping. 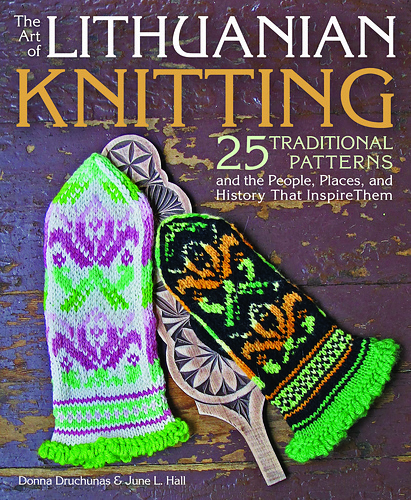 Interestingly, all of the mitten charts I’ve seen in Lithuanian knitting books—both vintage and contemporary publications—show the pointed tips, even when a photograph of the actual project has a rounded shape. I’ve included these mittens here because they were the first designs I saw when I visited Vilnius as a tourist in 2007. 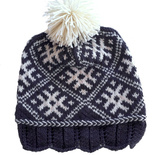 Made with heavier yarn and bigger needles than most of the projects I’ve designed, they make a good introductory project for those of you who may be new to knitting in the round with multiple colors.